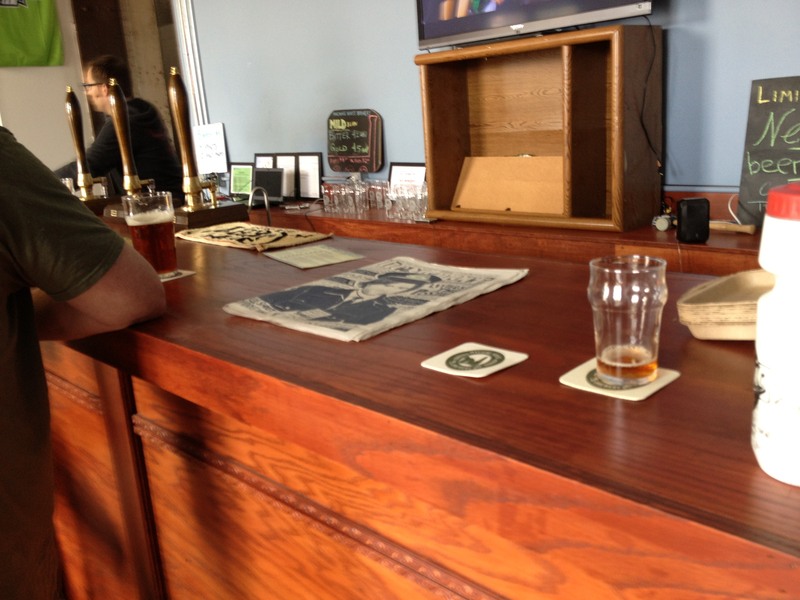 Updated July 8: An Adventure to Standard Brewing and Machine House Brewery. Now with Emerald City Brewery! I am not in the business of reviewing new breweries. Not on this blog anyway. Clue me in to a new brewery and I’m there as soon as I can be, but I leave the buzz and reviewing business to others. As such, I hadn’t planned on doing anything on these two new(er) Seattle breweries. The route from Georgetown to the Central Business District, however, I found worthy of documenting. I also was not in a hurry to visit Machine House Brewery because I read that they brew and serve only traditional English-style cask ales that are quite sessionable. I figured I’d get there next time I rode down to Georgetown, but I wasn’t in a hurry. My first visit to Machine House occurred as I participated in the 2013 Tour de Pints, put on by Flying Bike Cooperative Brewery. I was pleasantly surprised with my experience and decided I should share it with you sometime. 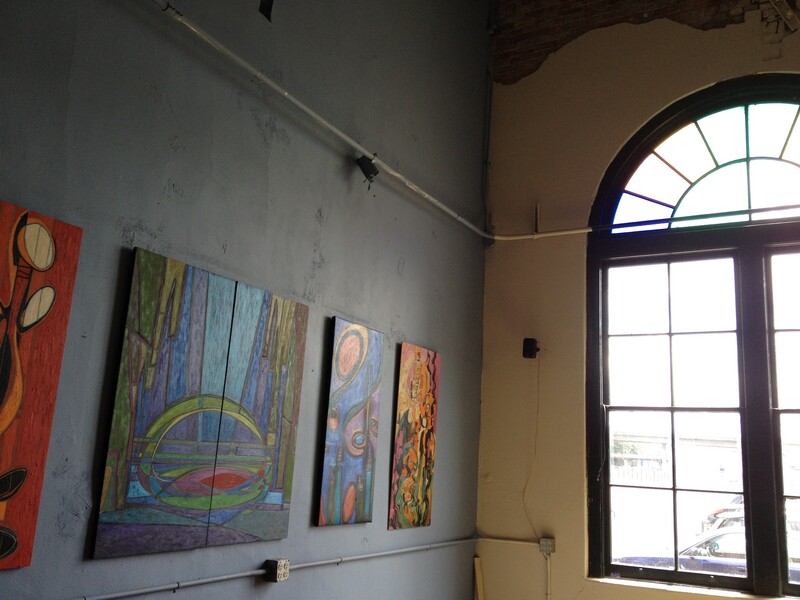 A view from inside Machine House Brewery. 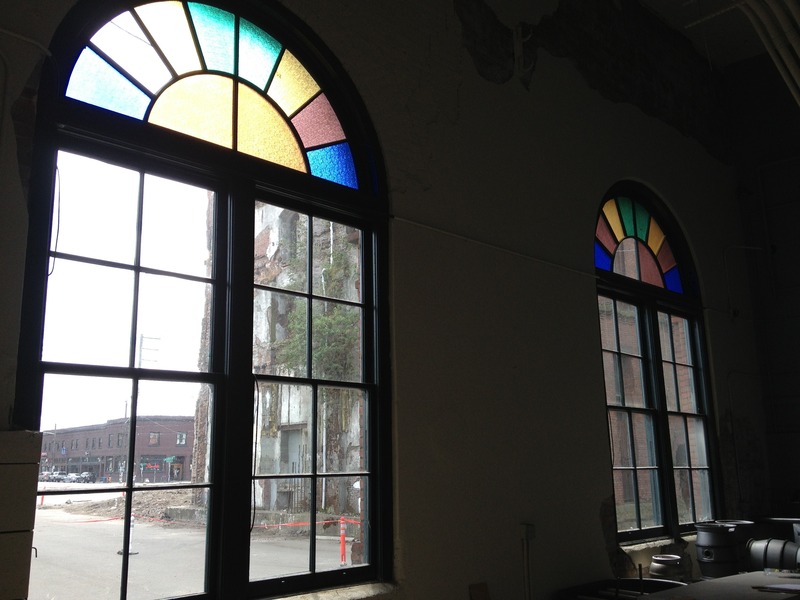 I succumbed to the charm of these windows. Across the street there are some of Georgetown’s hip little shops and bars including the venerable 9lb Hammer. Standard Brewing was a new brewery that I wanted to get to, but I didn’t get the opportunity until several weeks after they opened up shop. Pretty Standard, eh? Actually pretty attractive. Since the adventure to BJ’s and Airways takes me through Georgetown, I planned on hitting Machine House. 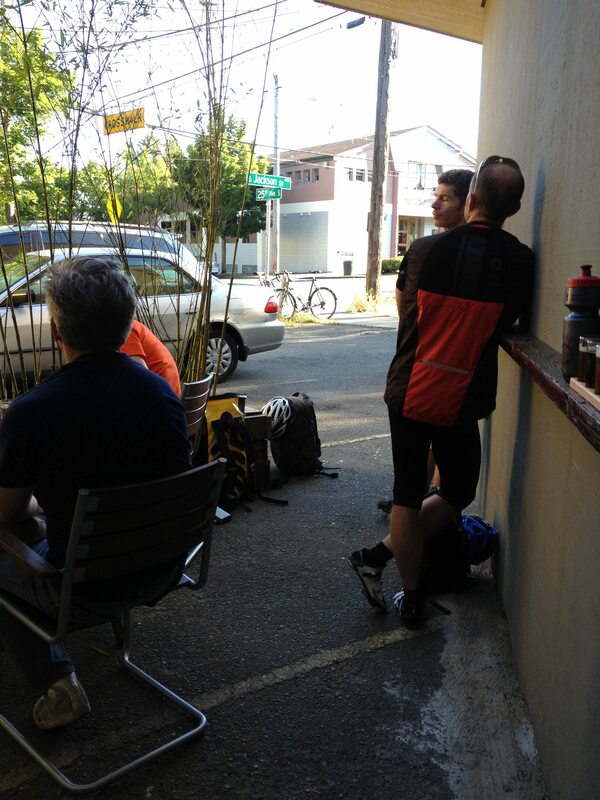 Very interestingly, at Airways Brewing I talked to a guy who arrived by bicycle with a friend. Turned out he was also going to Machine House after Airways too. I said maybe I’d see them there. We left at slightly different times and took slightly different routes, but I saw them on the Interurban Trail ahead of me a couple times, and once again as I emerged onto Airport Way and began that straight blast back into Georgetown. This gentleman, interestingly, was someone heavily involved in Cascade Bicycle Club and mentioned that he organized Cascade’s recent inaugural Brews Cruise. Outside Machine House Brewery. Taken during Tour de Pints. Cool brick just outside front door. Well, the whole place is brick. From the ferry terminal, head up Marion to 2nd where you make a right onto this one way street. There is a bike lane here on the left side of the road. Of course it’s busy and not all that safe a road, but it works. Take 2nd all the way south to Jackson where you make a left. On Jackson it’s a short stretch up to 5th where you turn right which takes you into the International District/China Town. At the very next street, in fact, a look to your left reveals one of those cool Chinese structures that stand over the roadway. Pretty cool. 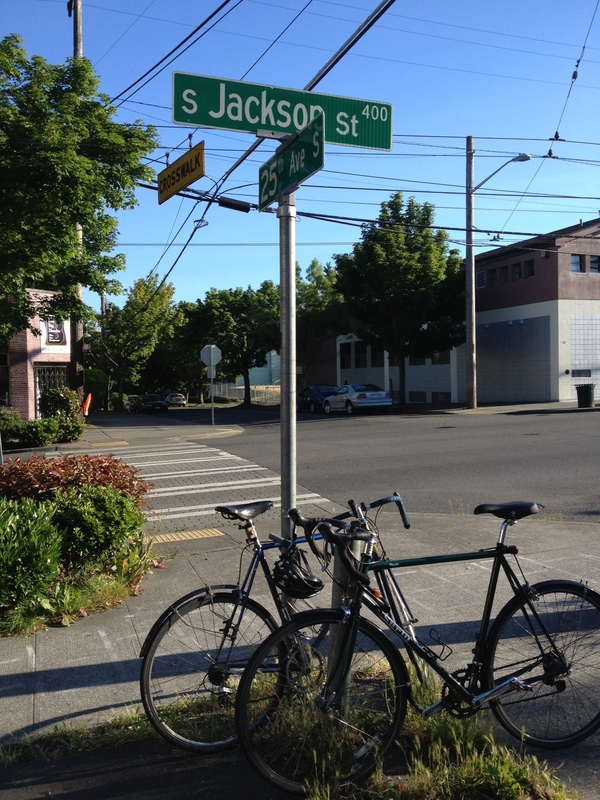 Continue on 5th – a street with no bike facilities – about 1500 feet until you reach the intersection with Seattle Blvd. Before you reach it though, you go by the large, well known and liked, pretty cool Asian market called Uwajimaya. I love that name. And oh the stuff they have in there! Now at Seattle Blvd., I take a position in the right lane as I wait for the light. We will be turning left here onto the diagonally -running street (not the 90 degree left which would be Dearborn). Of course make sure the driver(s) behind you who are going straight don’t hit you. It’s a short stretch until you take another diagonal turn, or veer you might say, onto Airport Way. It’s about two miles on Airport Way, a four-lane road with no bike facilities until you get to a nice brewery called Emerald City Brewery. You know what? I should do a quick writeup of Emerald City Brewery here since we’re going right by it. Pretty nice setup. On my first handfull of visits, the bar wasn’t there and the beer was dispensed from those igloo cooler setups. 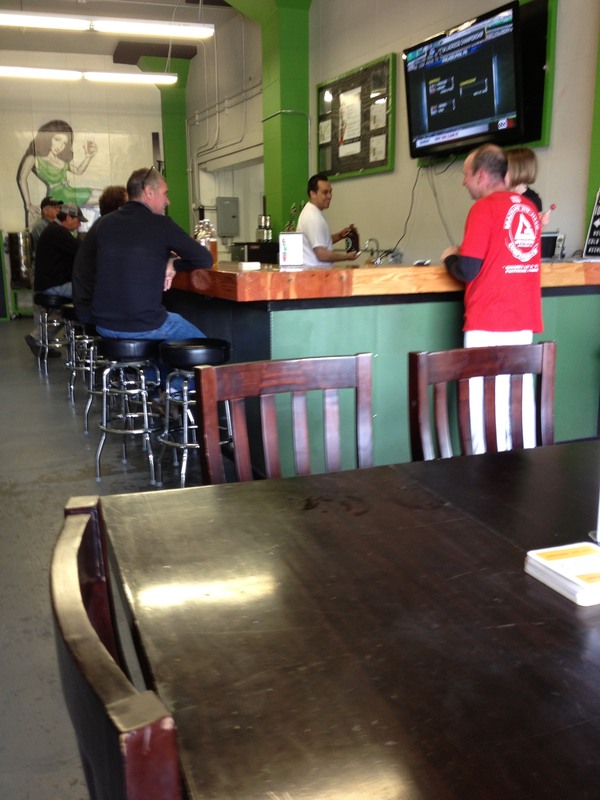 Back when Emerald City Brewery opened about three years ago I was excited to check it out. It was a bit difficult to find a time that they were open that worked for me, and I remember trying to call them a couple times and ask if they were open only to get voicemail and leave a message that wasn’t returned. When I finally got there though, the two guys who own and started the place were pretty cordial. In fact on a few subsequent visits they remembered me even though it was months between visits. Emerald City’s bread and butter is Dottie’s Lager. I guess that’s Dottie on the back wall. Yes, their theme artwork is the classic pinup girl. A large version of her is plastered on their artwork-wrapped delivery vehicle. 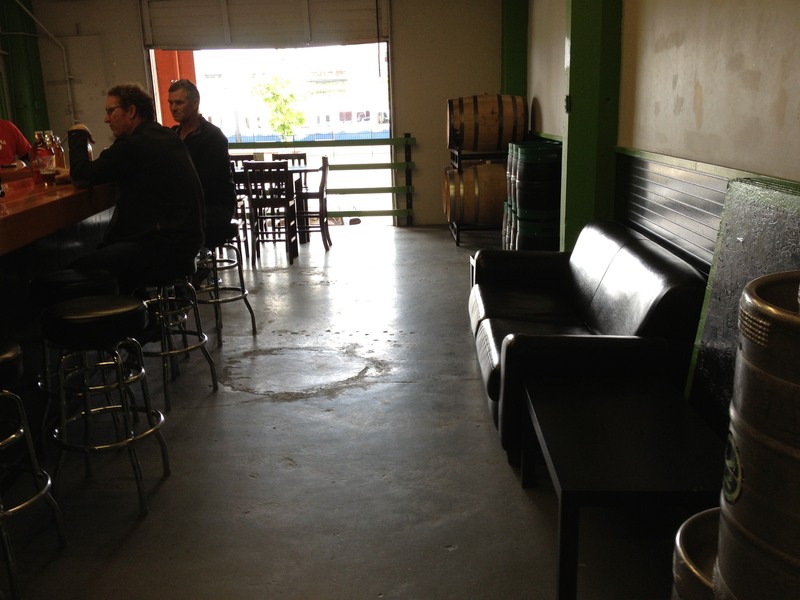 This brewery is located in a space formerly occupied by the Rainier Brewery. Pretty cool place to put a new craft brewery. Dottie’s Lager is produced off-site in quantities far too large for their small experimental, or beer-lab system to accommodate. 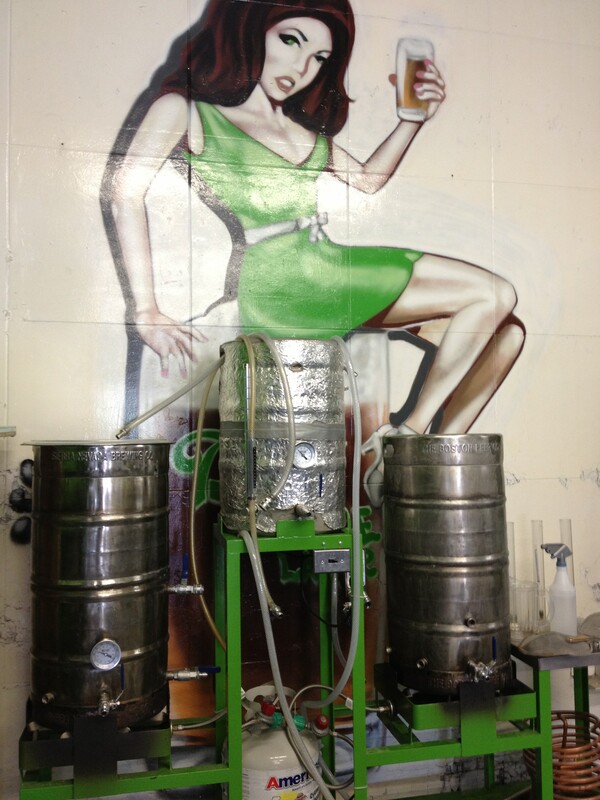 It’s on this very small, in-house system though that variations of Dottie’s and other beers are produced. The small system on which new beers are created. Emerald City at times caters to the younger crowd and the sports fans. They told me they want to be a go-to place for Mariners and Seahawks fans before and after games. Only one time has it been very busy in there when I’ve been there, and it was filled with younger, energetic folks. I’ve seen pictures of events they’ve held there that filled the parking lot out front with people. One of the variations I’ve had there is Dottie’s Lager aged in whiskey barrels. Last time I was in Emerald I was very pleased to see that they now have an IPA. It comes in at a respectable ABV (despite a recent trend toward making IPAs more sessionable which harkens back to its British roots supposedly, I believe an IPA should be 6.5% or higher) and was nice and tasty. A notable touch you’ll find at Emerald City is a urinal in the restroom that is made from a beer keg. A Miller Beer keg I believe. The owners told me that, yes, this is intended to make a statement. I had the privilege of peeing in another of these statements in Diamond Knot’s taproom in Mukilteo, WA – a Budweiser keg there if I recall. A view from the back of the place. Looking out the garage door. Note the light rail train across the street. Seems to be a big facility where these are based or serviced. Allright, now on to the heart of Georgetown where we will visit Machine House Brewery. It’s maybe 2 1/2 miles farther south on Airport Way from Emerald City Brewing to Machine House Brewery. All of it is without bike lanes or sharrows but it is typically not bad. In fact, only on my most recent trip down there did I find it overly busy. This was on a Friday. Maybe most of my prior trips there had been on the weekend and there is a lot of commuting traffic, perhaps to Boeing. Come to think of it, I believe in my prior post(s) I described the route down to Georgetown using 1st Ave all the way down to Lucille which takes you over to Georgetown. This was because the Airport Way bridge was out for what seemed like many months. I discovered a couple months ago that its replacement had finally been finished. So the route to Georgetown is as described on the map in this post. Unless you had somewhere else you wanted to go. Speaking of the bridge, I am glad that as before, sidewalks adorn both sides. Sidewalks that are wide enough to ride. I’m not sure if they were designed with cyclists in mind or simply to accommodate pedestrians passing each other safely. But they are the only way I advise riding across the bridge. Now there is just one problem: At the end of the bridge it decidedly is not designed for cyclists. You are let off the bridge after you are made to curve a bit around to the right at the intersection which serves to hide you from drivers behind you who are turning right. Further, they are none too happy when you roll on across that part of the intersection, making them wait and doubtless become indignant that a cyclist just transitioned from the sidewalk to the roadway or is riding across a crosswalk. If memory serves, this intersection crossing is a two-parter – first the one I just described then from that concrete island across the street the rest of the way. So, really if you have ridden the sidewalk across the bridge, there is no viable way to continue riding on Airport Way unless you are willing to annoy drivers and risk being hit. Dismounting may be the best option. Oh well. Once you get across the intersection, ride on for a bit more than 1500 feet to your destination. It’s hard to find unless they have a sandwich board out on the sidewalk which they are known to have. Machine House Brewery is in one of those big, old historic brick buildings on the east side of the street. The building used to house Georgetown Brewing which moved a ways to the north a while back. As I look at the map, I see that it’s actually across from where Doris St. goes to the right. Look between two buildings and you’ll see a tall brick smokestack back in the parking lot. If for any reason, that alley is blocked or if you miss it, don’t worry. Just proceed to the end of the buildings to a big open parking lot and turn in there and head back to it. The bar. Cask handles on left. That’s a 1/2 pint in front of me. In relatively nice weather you’ll find the doors open. There’s no official place to lock up your bike, but you can usually find something to throw a lock around. I haven’t yet mentioned that Machine House pours beers in Imperial Pint glasses (20 oz and shaped in that traditional British style). The glass pictured above is a 1/2 pint and shares the same shape. I believe buying a 1/2 pint here is a pretty good deal unlike at many places. Now, I’m not sure if the 1/2 pint is 1/2 the size of the 20 oz glass or if it’s literally a 1/2 pint which would make it a worse deal. The casks that hold the specialty beers you might say. 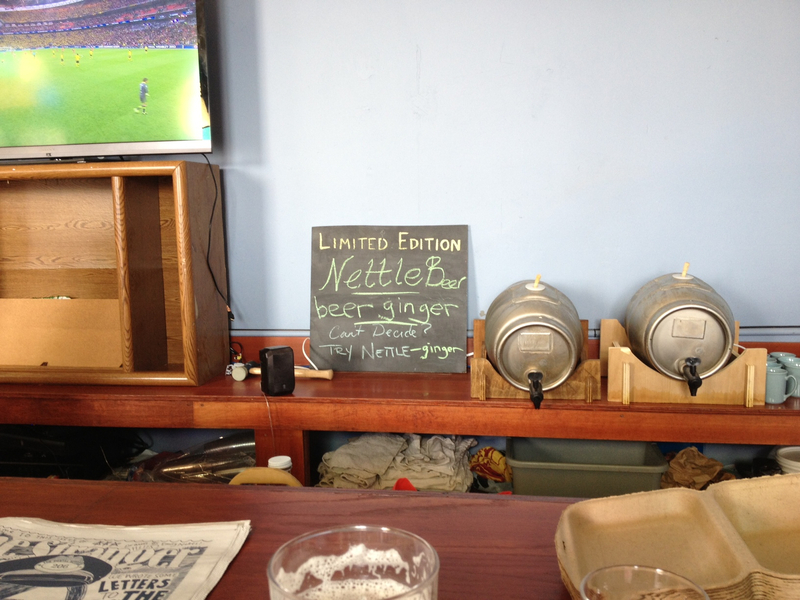 Note the sign for stinging nettle beer and “beer ginger.” Soccer, of course, on the tele. Along with the aforementioned 20 oz pours for the good price of $4 (no tax on that), here’s what made me decide I would make Machine House one of my options in the future: I enjoyed drinking the beer. Sounds like a “duh” I know. As I mentioned earlier, I wasn’t thrilled with the sound of their beers. I like carbonation in my beer and for it to be somewhat colder than cask ale. I also like my beer to be more potent than something in the 4.x ABV range. So I wan’t expecting to enjoy the beer that much. On that first visit, however, they had a stinging nettle beer and I found drinking it pretty pleasant. I also had their “beer ginger.” It is indeed beer, not ginger beer, hence the arrangement of the words. I found myself really drinking the stuff instead of something more akin to sipping as I do with more powerful brews. It was a refreshing experience. I must say though that I was considerably less pleased with their other beers which did hit my pallet like I expected them to. Still, I like the place. There is a pseudo European feel there (not that I’ve ever been to Europe). 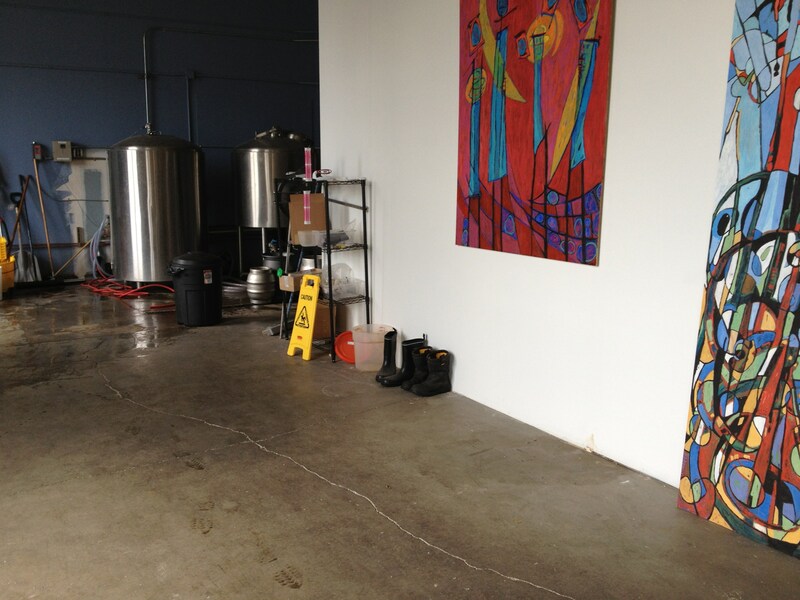 A view of the brewing operation back there past some art. Machine House Brewery is pretty okay with me now. It really represents the only brewery tasting room in Georgetown and come to think of it, is thus far free from that extremely annoying attitude you find in hip neighborhoods in terms of service. In times past my go-to places in Georgetown were Julie Mae’s Saloon and 9lb Hammer, both of which come complete with said attitude. Machine House satisfies an important need in its neighborhood. Next we’ll use a route to get back toward Seattle proper that I only somewhat recently disovered. It’s always neat when you don’t have to retrace your route and can instead make a loop. It’s on to Standard Brewing next. Exit the Machine House parking lot and turn right onto Airport Way. Proceed to the first stop light and turn right up the onramp-looking thing. This takes you nicely over railroad tracks onto Lucille St. At first you see a sharrows symbol on the pavement and soon it turns into a bike lane to help you ascend the ramp in safety. It’s pretty steep but not too long. There is a perfectly viable alternative to riding on the road here, and it’s riding on the separated sidewalk (or walking if you choose). Once you get up the hill, the sidewalk is no longer separated by a nice concrete wall and metal railing, but it’s still a sidewalk and still pretty wide. Whichever way you choose to go up this ramp, your next turn is near. Take a left on 12th Ave. After about 3500 feet on this street, you get to Snoqualmie St. where you make a little jut over to the right and then turn left onto 13th Ave. Shortly you get to Nevada St. where you make another quick jut over to the right in order to get to 15th Ave, a busy road where you need to go left. It’s a stop sign intersection here and you just have to wait until it’s safe to turn left. It is heavily traveled but has a speed limit of 30 mph. At first you have no bicycle facilities then sharrows appear. Between Spokane St. and Hinds St. a bike lane appears going this direction (it’s still sharrows the other direction). You are now climbing. At about Lander St. the environment becomes more business and less residential. At the intersection with Beacon Ave you lose your bike lane and are left with sharrows. Keep going straight on 15th Ave. Soon it’s back to residential. After a while the road changes names to Golf Dr. as you are going through a park though it’s not easy to tell. Your next major landmark is the bridge you curve down. It’s called the Dr. Jose P. Rizal Bridge. I don’t know who this guy is/was, but signage makes sure you know his name. It’s a pretty good decline here and riding out on the street is feasible due to your speed. Once off the bridge it’s sharrows on a busy street in or near the International District as you make your way to your next turn, Jackson St. Turn right on Jackson. Jackson is a busy major road in Seattle but it’s pretty common to see bikes here. I’ve never had much trouble on it. When the road begins to climb you get a bike lane. There are indeed some climbs on this stretch as we head toward our destination. See the map for a bit of detail. Your Jackson St. travel is maybe a 1.25 miles. At 25th Ave. you can see Standard Brewing across the street. If you are inclined, make a left here, or if it’s busy you may want to dismount, get over onto the sidewalk and use the crosswalk. 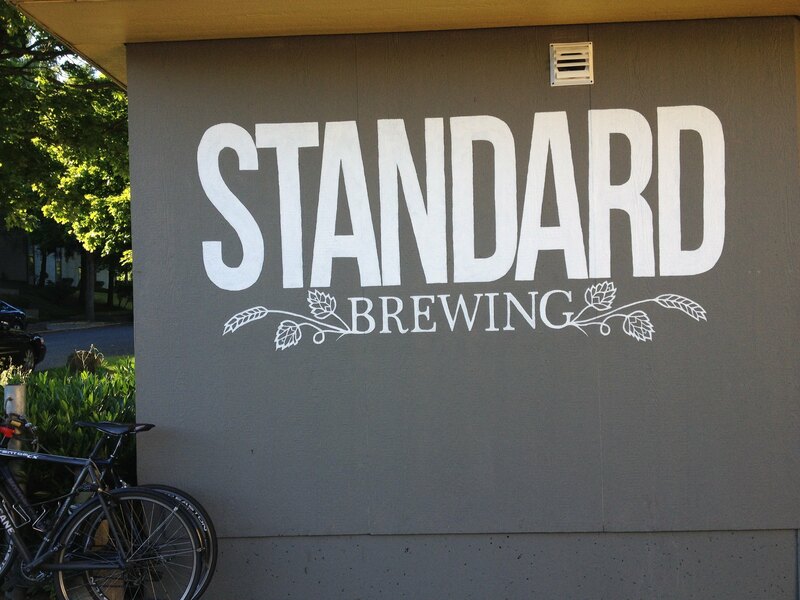 We made it to Standard Brewing. Let’s check it out. The sight of the place from across the street as I rode up was pretty striking. This place needs no sandwich board out front. The name is painted nice and large in white on the front of the grey wall. It was refreshing to have such a clear signal I’d found the place I sought. 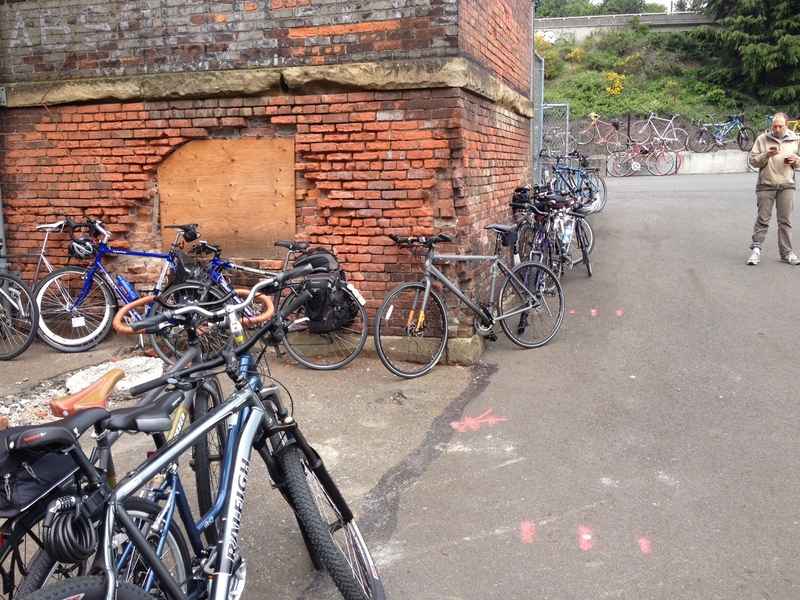 I don’t recall any official bike parking but I locked up around the side to something like a gas meter or tree. Was very nice to have fellow cyclists there. This shot was taken from up by the front door. You can see the squeeze it takes to get in. Heading toward the entrance means squeezing through a fairly narrow walkway. At least it is narrow when you have people standing there drinking their beers. 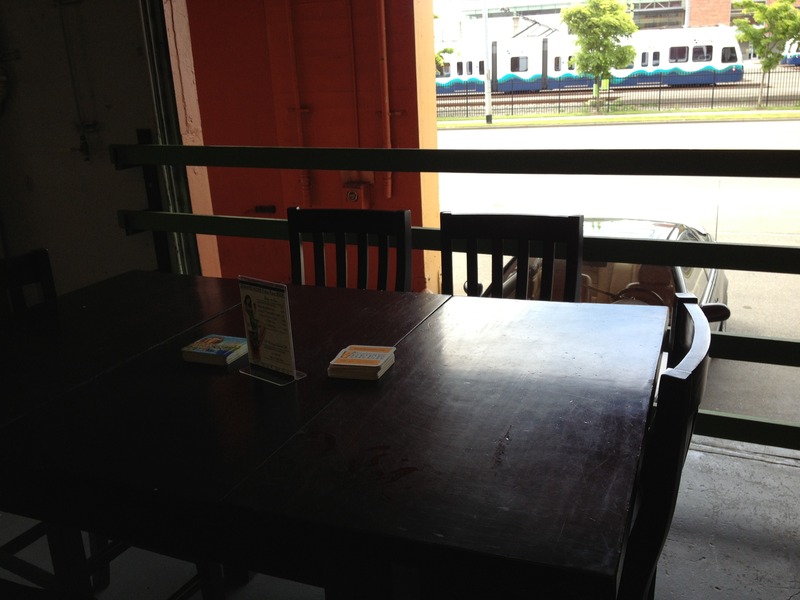 To the right is some outdoor seating as you head toward the door. Once inside you see a very minimal space with flat black walls with some art on them. 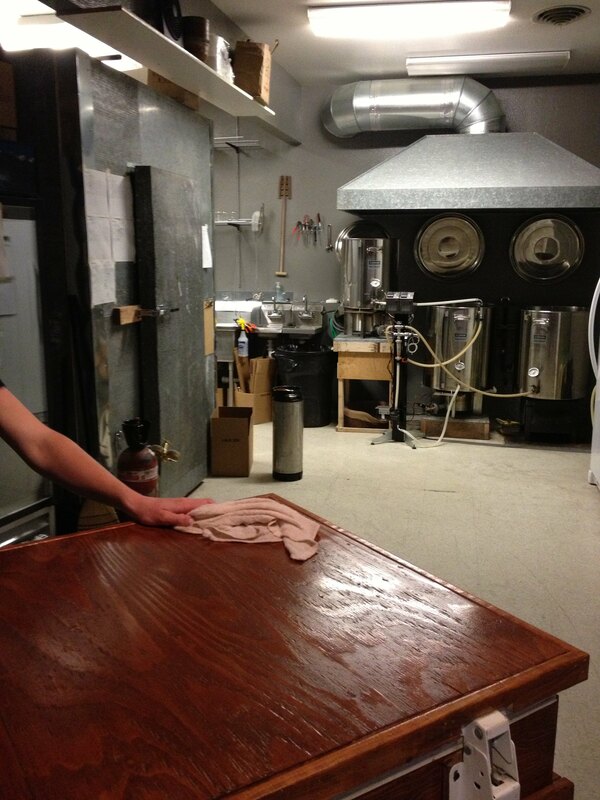 To the left is the counter and beyond that the brewhouse with its small system. The hand of the nice beertender wiping up. Beyond, see the brew system. Above and to the right of the counter is the menu board which is of a distinctive type. It seems to fit here. Don’t know that I’ve seen a beer menu board of this type before. It works nicely! 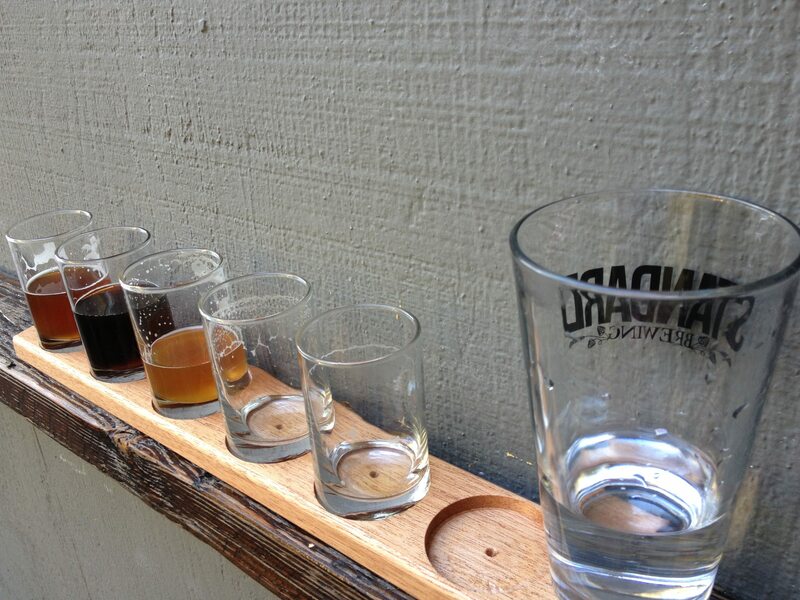 The beertender was nice and cheerfully dispensed me my set of tasters. I believe I saw it listed somewhere that a taster set of all the taps was available. I opted for that, but had to specify that I didn’t want the last two offerings, ginger beer and pineapple beer. While I am intrigued by them, I didn’t have room in my belly or day for them. I took my rack of little glasses outside where I found a spot at the nice railing they attached to the wall. A great idea that makes room for more customers, but at the same time it makes things crowded along the walk. I enjoyed standing there with a view of the intersection and all the traffic as I explored my beers. Here are your cross streets. And your cross walk. And a couple bikes locked to a do-it-yourself bike rack. Standard Brewing’s beer was good. I remember enjoying most if not all of them. I don’t recall if I liked the red or not, but I don’t like many reds. I am impressed by the fact that Standard’s beers come in at respectable ABVs. This is clearly a conscious decision. Even their pale is over 6%, and their West Coast IPA is 7.3 which for me is about the magic number for an IPA. I’ve had many lower ABV IPAs that tasted perfectly fine, but for me and IPA should be serious. It seems to me Standard is bucking the trend of leaning toward the sessionable. I would comment more on the taste of their beers, but it’s been a few weeks since my visit and I don’t remember much more than I did find them nice and tasty. I like this wall rail. I don’t know what is behind the name Standard Brewing. For me it fits. They’ve got a plain little building in a non-fancy location. Their color scheme is black, grey and white. Their beers are solid. I would like to make it one of my standard places. The ride back to downtown is mostly a straight, mostly downhill, shot down Jackson then simply using the appropriate streets to get where you need to be. My map shows, as always, directions back to the ferry terminal. So after flying cautiously down Jackson, turn right on 4th. At Yesler Way, the road takes a slight curve left as you go under a bridge. After the bridge, a bike lane appears on the left side of the road. 4th is a one-way street and I always ride in the bike lane on the left side of the street, but coming from Jackson, there is no bike lane and as such I feel a bit funnier about being on the left. I suppose after enough jockeying with buses, I might take to using the left side all the way from Jackson. At Columbia St. turn left and follow it down to Alaskan Way where you turn left and find the ferry terminal entrance ahead on the right. Thanks for joining me on another adventure! I look forward to our next one. Well, the word is in: It WAS epic. You may recall from my previous post that I suggested that my upcoming adventure might be epic. Forgive me for using a currently overused word, but I think this is an appropriate usage. As explained in the previous post, I was over in Seattle with our car, having dropped someone off at the airport. Not wishing to waste the $32+ we paid for the privilege of driving onto the ferry and back, I planned and executed a hybrid adventure that saw me driving from SeaTac airport to Issaquah then cycling to Snoqualmie Falls Brewing and back. My route was something I cooked up through research using my go-to tool: Google Maps, and that is, in part, what made this adventure so epic (that’s the last time I’ll use the word in this post – maybe). See, my plan was to set out on trails, the existence of which I suspected thanks only to Google and the magic of the internet. I had been to Snoqualmie Falls Brewing a couple times before, however it was by car and coming from I-90. I had not been to Issaquah and hope to never be there again, save possibly going directly to the trailhead parking lot then leaving. More on that upcoming. So off I set from the airport, choosing this new adventure over my past favorite: driving all the way up to Bellingham’s Boundary Bay Brewery. Driving to Issaquah from SeaTac was a breeze as you might expect. My introduction to this lovely town began early with a traffic run-in with an aggressive Asian punk in a Lexus who honked at me for not turning right on the red coming off the freeway offramp. I accommodated him by going ahead and proceeding on the red, only to find him tailgating me in the 25 mph zone that followed. When I pulled over to let him pass, I found him returning my mean-mug. So, I put myself at risk of a ticket by turning right on a red when I wasn’t sure it was legal only to be aggressively tailgated as thanks. My next tailgater was a dude in a big 4×4 who roared around me to cross over lane markings and get into the turn lane up by Swedish Medical Center. Moments later, as I was making my way through that parking lot, trying to get turned around and back t0 where I needed to be, I enjoyed his stare as he drove by. Nice introduction to Issaquah. Folks, here you see one of the reasons I hate driving. One thing I noticed during this was the presence of a nice sign that indicated the trailhead that I had planned on using. I recognized the parking lot-like area from my research, but the Google images from 2011 did not show this sign. I was very pleased to find this sign, and what appeared to be some cars parked in the lot. Perfect! I had planned on parking my car in the lot of the supermarket up across the street from the Rogue Issaquah Brew House and hoping I didn’t get ticketed or towed. So park at the trailhead I did. 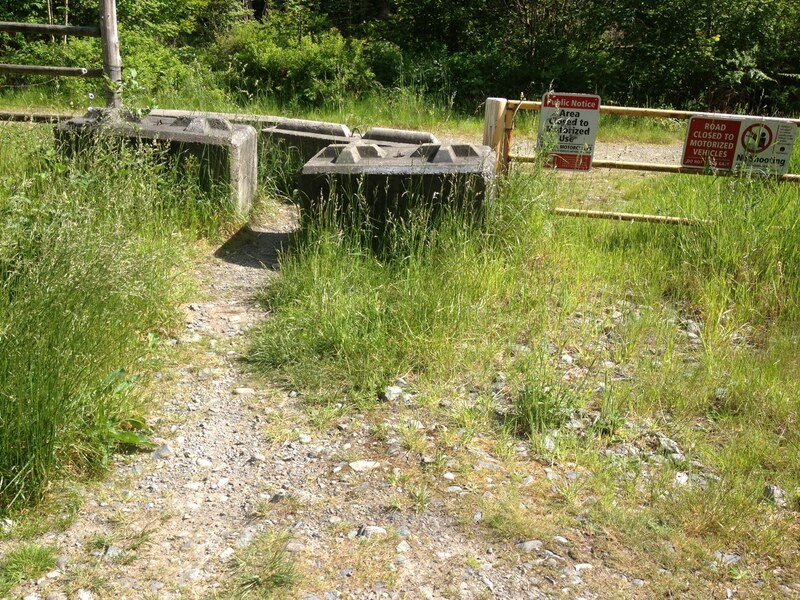 As indicated on the map found at the following link, the trailhead is not at all far from the offramp from I-90 fortunately. I got my bike out, loaded it up with my cargo and walked over to look at the nice map at the kiosk. There was no “you are here” on the map which made it less useful. It was quite unclear where the trail began which I had planned on using. There is a nice dirt trail leading the direction I needed to go, but it is quite steep and unsuited for cycling with a road-type bike. So as I had suspected, I needed to get out on the sidewalk and start riding. Right away begins a gradual ascent that lasts for miles. Shortly you cross at a crosswalk and onto an inviting separated sidewalk. This takes you safely to where your trail actually begins. I was still unsure whether I was on the correct path toward my goal, but my concerns were allayed soon by some nice signage which indicated that I was heading toward Preston. 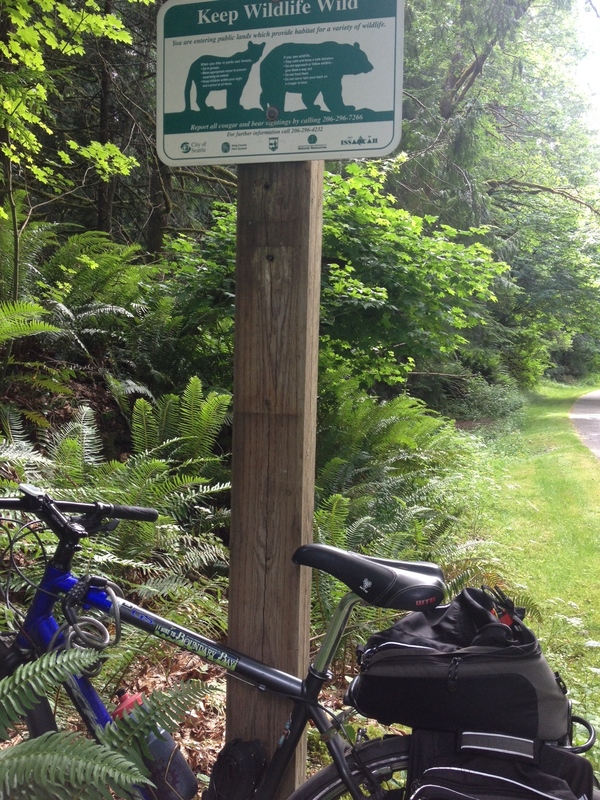 I knew I wanted to be, on this initial part of my journey, on the Issaquah Preston Trail. Before long, the nice paved trail gives way to gravel and rock – yes rock. I’m not sure why but the trail here, and for quite a distance, is made up partly of rocks ranging in size from golf ball to softball and larger. I didn’t expect to be subjecting my poor bike rims to such punishment. I was fully loaded at this point with three sandwiches, five hard-boiled eggs, a full Nalgene bottle and a bike bottle of water, two empty beer growlers and the rest of my gear. Given the foregoing in addition to the uphill nature of the route, it was fairly slow going here at the start of my journey. Nice to get out into nature. You can see a nice stream on the right. This section of trail appears pretty smooth. After 2.5 – 3 miles the trail crosses a street that leads to an onramp and offramp to nearby I-90. The trail here does parallel the interstate. After about 1.5 more miles, the trail unfortunately dumps you out onto a road (High Point Way). There is a generous shoulder on the side of the road heading this direction, as well as a good one on the other side. You can see that the shoulder was widened at some point. I chose to ride on this side of the road on my return trip in fact. This on-street ride is less than a mile. At 300th Ave the trail begins again on the opposite side of the road. Not far at all after that, at 79th St, the trail takes a left. Follow the trail past some industrial buildings and businesses and an athletic park. After about 3.5 miles the trail takes a right and once again dumps you onto a road (Preston-Fall City Rd). If you miss this right turn like I did, you’ll simply wind up at a nice bench at a quaint viewing point. Note: The following paragraph will probably not make sense. You have to be there. This street-dump is one of the most significant parts of this adventure. Our friendly trail delivers a stiff upper cut to the uncertain pilgrim by going steeply downhill to the busy road where a crosswalk is found, offering as much protection as a cardigan at the running of the bulls. Actually the traffic here on my outgoing trip wasn’t that heavy. On the return trip, however, it was downright thunderous. Once across, the trail goes to the right. Instead, I went left on the road (remember on the outgoing trip, it wasn’t that busy). Soon the trail picks up again, allowing you to get off the road. Why did the trail go right back there at the crosswalk? Because it’s a loop that runs along the road, turns left, and returns you back around to the trail again. I chose to forego this loop and save some distance. In doing so, I noticed that the trail picked up again, on the other side of the low concrete barrier, before long. On my return trip, with the thunderous traffic, I did not ride out on the road but instead got onto the trail, separated from traffic by this wall. After a ways, the trail runs out, leaving you to push your bike on the dirt but you’re separated from traffic by the concrete wall and at some point by the metal guardrail. You are, though, just feet from 50 mph+ traffic. Maybe next time I’ll try the loop you’re supposed to take. At any rate, you have crossed the road and can continue on your trail. You’ve got it made, right? Yep. If you like to exercise. See, shortly after getting back onto the trail, I noticed some quaint-looking wooden fencing. Oh, I thought, someone’s property where they must keep horses or goats. No, those are wood retaining walls supporting the switchbacks you must climb – on foot unless you’re particularly strong and in the mood. 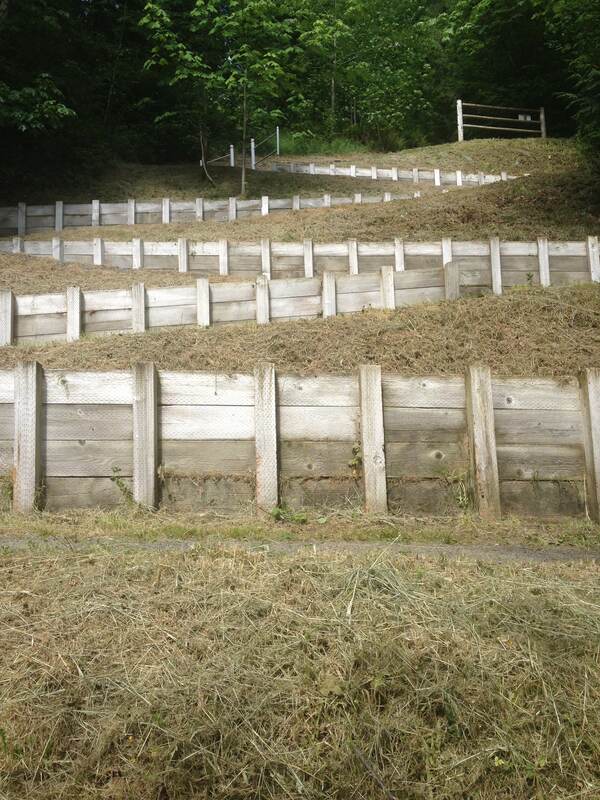 Tip: given what awaits on Lake Alice Rd., walk your bike up the switchbacks. After climbing that, your trail resumes and you can relax for a while. After about a mile you reach your next major landmark: a parking lot with a porta potty It’s here that I faced a decision. Do I go straight and stay on a trail that according to the map leads toward my destination, but possibly dead ends? Or do I assume it dead ends and go ahead and get out on the road – an unfriendly road – and proceed that way? See, on the map, the trail seems to end quite close to a residential street that would connect me to where I need to be. I figured there was a good chance it would connect, even if unofficially. I decided to try the trail, that was about three miles long, and figured if it dead-ended, it wouldn’t cost me that much time unless the trail was steep. Fortunately, not long after I got onto this trail, I encountered two nice ladies strolling together with a small white dog. They were coming the opposite direction. As I approached them, I slowed and asked them if the trail dead ended. The provided a convincing answer: yes. They said there is a bench there, and a porta potty and a sort of peekaboo view of Snoqualmie Falls through the trees. Thank you, ladies! You saved me some time. Actually, I spent some of that saved time rolling along with the ladies as we chatted. They were pretty interested in the fact that I was cycling all this way to visit a brewery. We discussed my directions which didn’t really make sense to them. That’s to be expected, as the route is quite possibly original with me, and is passable only by the non-motorized traveler. We finished our pleasant visit, I rolled by the little white dog, bidding him/her adieu, and got out onto Lake Alice Road. It’s here where I met the most significant event of my journey: a climb up Lake Alice Rd. that I am satisfied with classifying as brutal. Perhaps I would’t quite classify it such if I hadn’t been quite low on sleep, pretty heavily-loaded with cargo, and unsure about my directions, not knowing if all my efforts would be in vain. There I was though, setting off on the roadway, cheerful after my nice encounter with the ladies. It wasn’t long at all until the reality of this road smacked me in the face. I downshifted, stood up and began to pump. The climb, at least until the point I reached a definite landmark telling me my directions were correct, was about 1.5 miles. The road after that awesome point remained uphill, but the experience much more enjoyable. There is no shoulder on this climb, making things considerably tougher. Traffic wasn’t heavy, but sight lines are short. I must admit that I dismounted and walked part of this stretch, and when a car would come up behind me, I would stand off as far to the side of the road as I could, keeping my bike on the road side of me. I had on my florescent, reflective vest, had another one hanging from the left handgrip of my handlebars, and both red blinking lights on toward the rear. My mind was on high alert, and my body dialed up to max. The discovery of the Y in the road my directions said should be there was a joyful event. I was questioning whether I was going the right direction. As I trudged up the hill, I recognized the intersection ahead, thanks to trusty Google Maps Street View, and when I drew closer, I was able to confirm that the street signs read as they should (note: the map says that the left turn we need to take is 73rd Pl./Lake Alice Rd., but the actual sign simply reads Lake Alice Rd.). As stated, the climb, which if I recall, mellowed a bit by this point, was much more enjoyable as I now knew I was not wasting my time. What’s more, the road now felt more residential which makes sense, as it only serves a limited number of homes and is not a through street. On this stretch, a school bus driver, who had passed me a ways back, gave me an appreciative smile which I happily returned. I knew that the lake ought to be on my right, and this was finally confirmed when I saw a road leading to the right, and a sign indicating a public fishing area. Before long came my next major landmark: an end of sorts to the road and the beginning of what appears to a gravel driveway. This was a major point of concern for me, as I didn’t know if this gravel road/driveway was passable, or if it was going to lead me uncomfortably and problematically right up to someone’s house (and of course, one never knows how amenable residents are going to be to uninvited visitors). Fortunately, I was pre-equipped with satellite imagery knowledge that this road led to more than one house, which weighed in my favor. I also had seen evidence that this road led to at least some sort of road or pathway that ran along under power lines. It is this path that represented the last key unknown in my journey. As I rolled along the gravel road, passing a couple of houses, I finally came to a spot that appeared to lead directly to one last house. This was it: Was the brutal climb – and this whole journey – in vain? Just then, I noticed a small trail of sorts to the left that led to a pathway. It dawned on me that I ought to get off the driveway I was on and try this path. I checked my directions and confirmed that I should turn left. I did so and began to realize that I was probably on the correct path, as there were power lines overhead. Now, it was down to whether or not soon this path would exit into a newer residential development that I had seen in my planning. The expectation, the hope, the tension were all reaching their highest point. This was make or break. Was I on the right path? Was I traveling the correct direction? This is part of what helps define epic. Major disappointment or glory was about to be revealed. I was happy to see ahead the rooftops of some houses that could fit the description of what I sought. Then it came into sight: The paved path! This was it – I knew it! It was all or nothing here, and I got it all! My adventure would be a success! My mammoth effort rewarded! I rolled onto the welcoming asphalt and soon emerged onto the clean roadway with sidewalks and cookie-cutter houses that I had seen on the computer. What a stark contrast to the territory from which I had just come. From here, I knew, it was just a quick jut over to the right on, Douglas Ave., where I would come to a major intersection, just this side of which would be a nice, official, paved path. 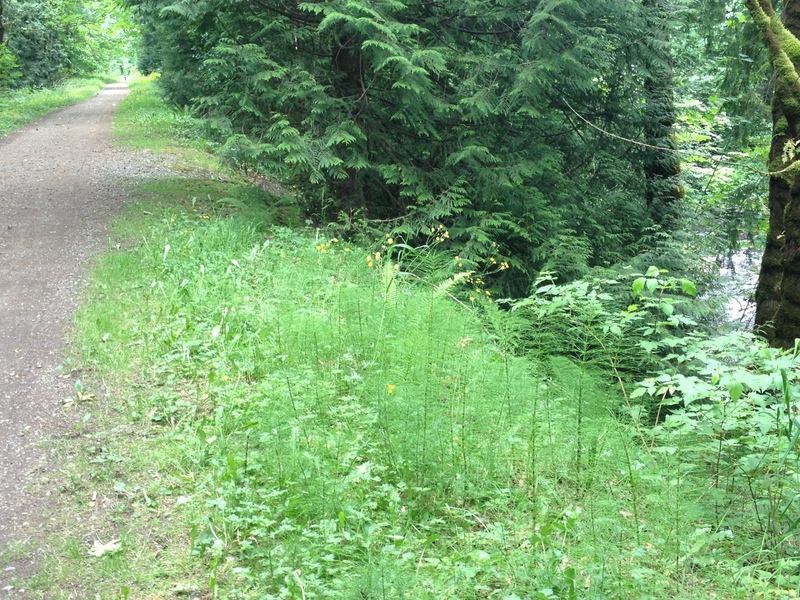 This path, the Snoqualmie Ridge Trail, paralleled a busy thoroughfare and lead me into Snoqualmie. When the trail/road comes to a T at an intersection, go to the right onto another trail (Centennial Trail) and continue along side, and crossing back and forth over, the railroad tracks and going through a park until you reach King Street. As you go along this trail, you are treated to some interesting sights, including old broken down, antique rail cars on the tracks which are on display complete with signs describing them. I didn’t stop to look at this stuff or at the display of a truly massive section of cut tree on a rail car that had a building built around it. This section of felled tree was awesome, and I would normally have stopped to find out its significance, but I was way to determined and plain beat at this point to do anything but get to my destination. Unfortunately for me, I was so determined that I didn’t feel like stopping and looking at my directions which would have let me know to look for King Street. So I kept going straight, eventially losing the path and winding up out on the roadway – going too far and out of my way. Finally, I stopped, checked my directions, then turned around and went back to where I needed to be. 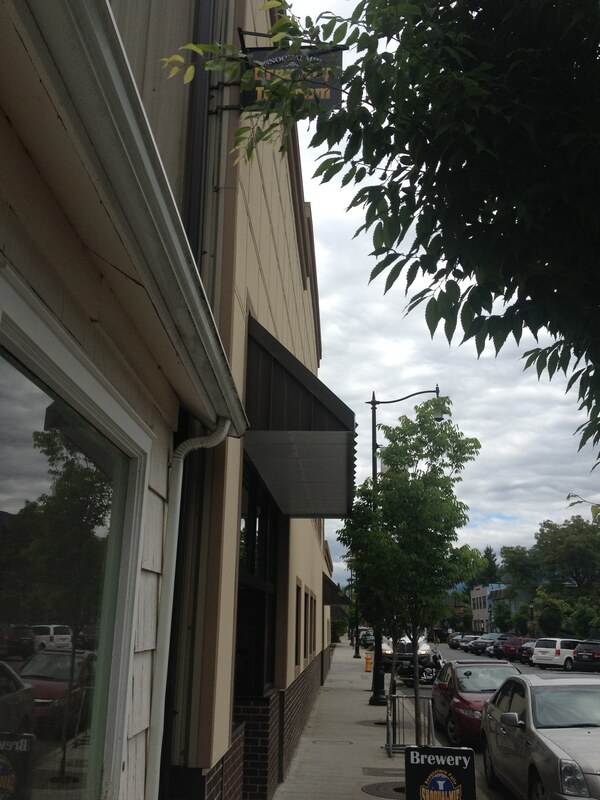 King St. takes you one street over toward the river and Snoqualmie Falls Brewing is not far from there (8032 Falls Ave. SE). From King St. and Railroad Ave., it’s a right turn and just a short distance to our destination which is on the left. It’s a non-distinct building with a custom neon sign in the window and a small sign over the sidewalk. Well, we made it! I will relate my impressions of, and experiences at, Snoqualmie Falls Brewing next. I locked up to the small bike rack on the sidewalk just a bit over from the front door. The place looked familiar once inside. I recall having a pizza here with my wife on the way back from Walla Walla if I recall (Spring Wine Release Weekend). View from the bar looking toward front door. Crummy pic, I know. 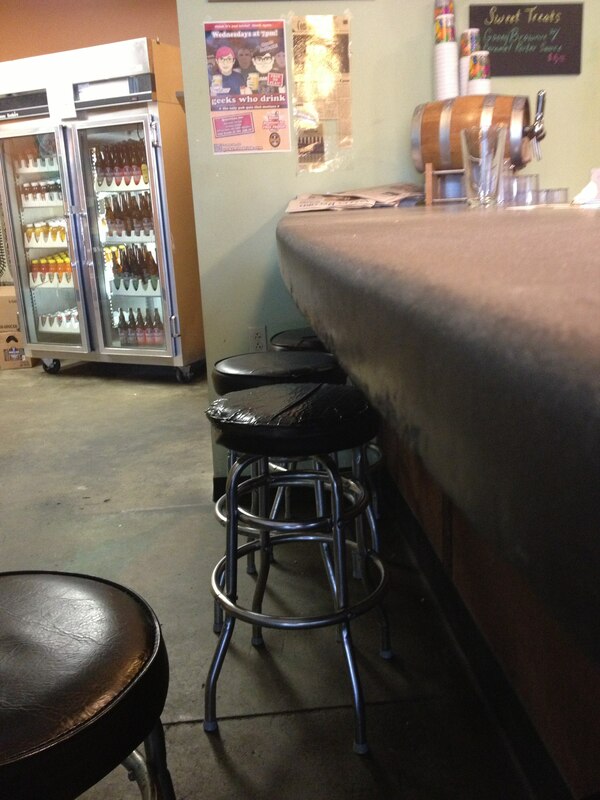 I took a seat at the small bar which had room for maybe half a dozen seats. The other patron at the bar was a leathered up biker guy being bikerly, but in a jovial way. I was pleased to note at least one set of apparent tourists taking pictures. (I don’t like to be the only non-regular in a joint). Thick concrete bar. Cooler of bottles (and juice) in distance. As I began to scan the offerings listed on the chalkboard, the beertender asked in a less than friendly manner what I’d have. I told her I was still deciding. She provided a beer menu. Thanks! My three tasters and the taps. I can tell that’s the IPA on the right. Not too much later, she came back and checked with me. I asked about taster sizes. She held one up and couldn’t answer my question as to how many ounces they held. Oh well, I ordered taters of Copperhead Pale (5.3%), Summer Beer (5.6%), and Wildcat IPA (6.6%). The first two were fine, if weak and bland tasting. The Wildcat was good – a nice IPA with a balance of hops and malt. As I was enjoying these, a rather burly bearded employee emerged from the back. I assumed he would be surly, but the opposite was true. He inquired what I was having, and if I liked it, and was generally very cordial and genuine. After that, the beertender woman was more friendly for some reason. As I was almost done with these tasters, the burly guy asked if I wanted something else. I said I’d be trying the Black IPA and the Powerhouse double IPA before I left. So right away he got me a taste of each – a taste as in a free splash. Perfect! Both were good. The Black IPA (6.5%) was surprisingly light in color, and interesting tasting. Less roasty than I expected, and a bit sweet but not too malty. A good beer. The Power House (7.5%) is a solid double IPA, heavy on the malt backbone and not very hoppy. I had brought with me two growlers. When I asked the beertender if she minded if I went out to my bike and got them, and offered to leave her a card, she joked that the card wouldn’t be necessary, as she was a fast runner. Maybe she wasn’t joking? You never know. I filled my growlers with the Black IPA and the Powerhouse Double IPA. I just realized that as I write this I am sipping a glass of the Powerhouse. Hard to believe that I carted this beer from Snoqualmie to Issaquah on steep shoulderless country roads, bumpy trails through the woods, alongside busy highways separated from high-speed traffic by a couple feet and a guardrail, and you name it. It really makes the beer taste better! The price on growler fills was $9.25 plus tax. You never know if a place has tax included in the prices, or if it’s tacked on top. Annoyingly, this place does the latter. To their credit though, the growler fill price is reasonable, and quite notably, they didn’t charge more for the “big” beers than for the non-big beers. You just never know what a given place’s policies are going to be. Soon it was time to go so that I could wind up back in Issaquah at about the time I wanted. I reversed my route in order to get back to my car at the trailhead in Issaquah. Best believe the flight down Lake Alice Rd. was more enjoyable and faster than the outgoing trip. I guess they must have these in these parts. Saw this sign just after crossing the busy highway at the crosswalk. Interestingly, there was no such sign on my outgoing trip. 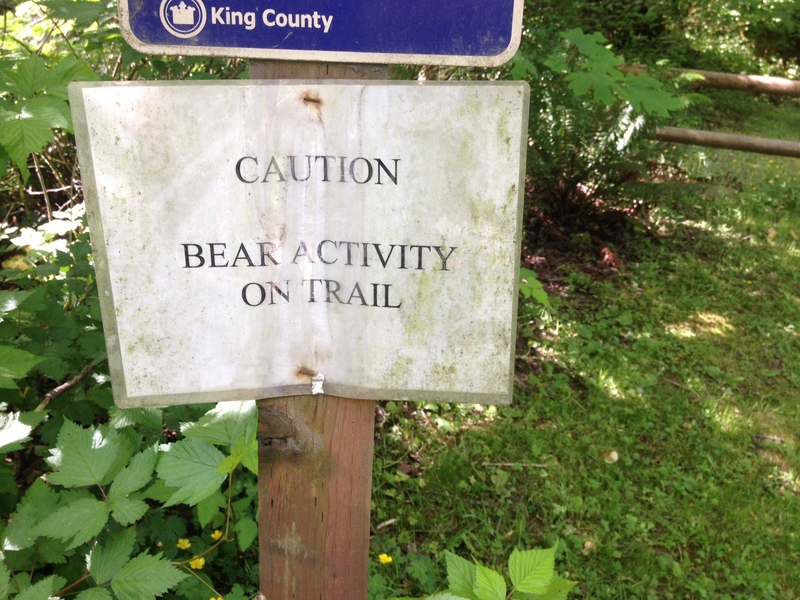 So it’s not clear where the bear activity began. But I rode through it. It was very good to get back near the trailhead. I was plenty tired. Back at the parking lot, I quickly got my bike back into the car. There were three young people lounging in chairs next to the car having a plant sale which I might have checked out were these kids not smoking cigarettes. I made my way into town and decided to go ahead and park in that grocery store parking lot rather than try to find on-street parking. Traffic was pretty heavy on the streets of Issaquah on this Friday afternoon. After parking and running over to the entrance of Rogue Issaquah Brewhouse, my revelatory experience began. The young woman who greeted me at the door was quite friendly and professional. That’s where it ended. 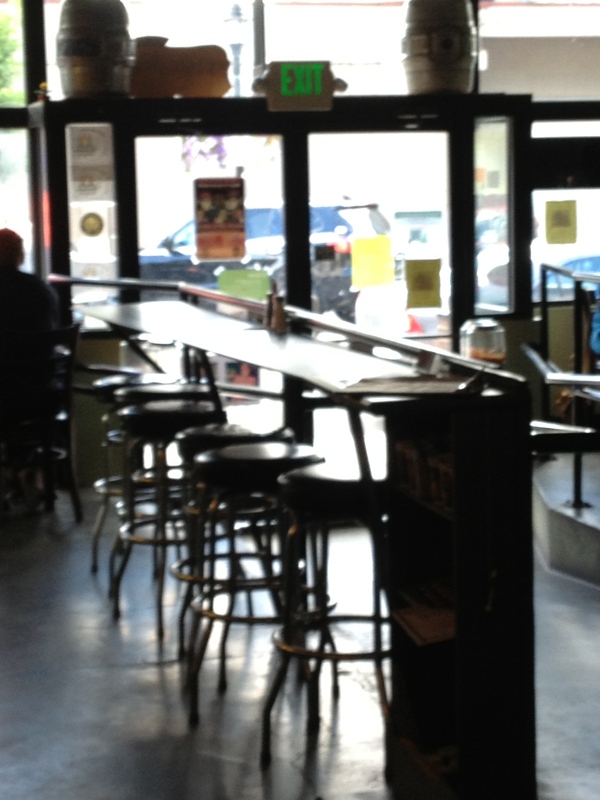 I took my seat at the bar – the bar that had little brass placards at each spot with someone’s name on them. This was indicator number one. I mean, what good can come from labeling spots at a bar? If the person shows up whose name labels the spot your’e occupying the very least you can expect is an attitude. That didn’t happen, but attitude I did get at this place. Rogue Issaquah Brewhouse is, well, pretty dumpy, or to use a term I learned from my wife: “towny.” I wasn’t expecting this. Rogue is a big name in the beer world as you know. I had a good time at one of their brewhouses in Portland. In restrospect though, that place was a bit rough as well. Across the bar to my left were a couple of loud-talking white collarish types. Just beside me on my right were a duo of backward ball cap wearing toughies, one of whom bumped me as he got up and didn’t acknowledge it at all. I looked at him but he didn’t return my indignant gaze, which was a very good thing, as I am pretty sure the yahoos would have started a fight. So let me get this straight: I am at a dumpy bar and I also have to put up with attitude. Just smashing. To complete the ridiculous picture, I found out that my beer came to $6.33. Okay, that should by you two beers. As you might expect after reading this, the bartender provided me an absolute bare minimum of information about the beers when I asked for it, and did so in a huff. Now, here’s the cherry on this little scoop of ice cream: When I cashed out, which was well before I finished that beer, and got my bill for $6.33 I laid down $7. The stinking lump of a bartender kept my change without saying or even gesturing a thing. He just kept it. The fricking gall. 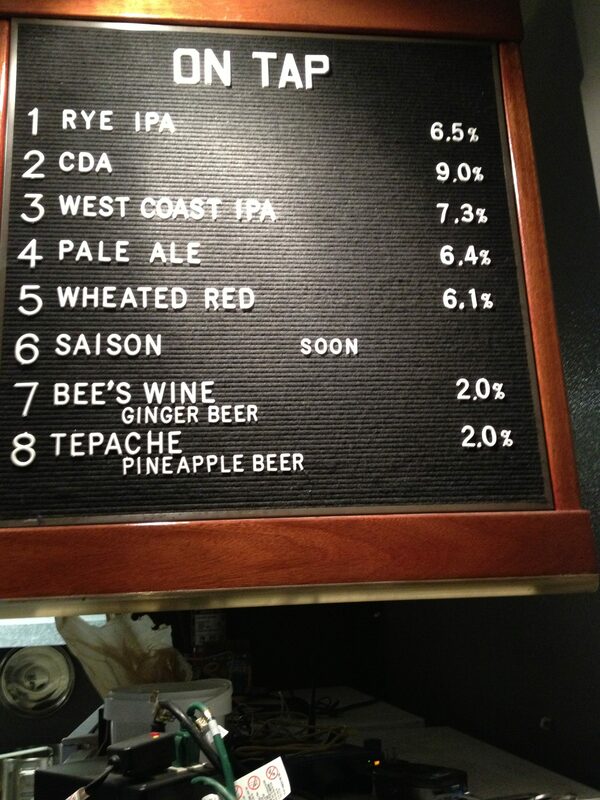 Ladies and gentlemen, Rogue Issaquah Brewhouse has it wrong – all wrong. Completely opposite what a beer place, or any place should be. I don’t spend money I can scarcely afford to be spending to receive an experience like this. Live and learn I guess. Oh, and yes, I did flag down the bartender and ask for my change back. He was visibly taken aback by this for a second, and after he delivered it, he glared at me several times as I finished my beer. I used the graffiti-endowed bathroom then exited that hole of a place like a dog being let out of a crate. I couldn’t get out of that place – or out of Issaquah – fast enough. Traffic was, of course, heavy as I worked my way out of the grocery store parking lot. One shining, confusing moment occurred as I tried to exit the lot: A driver in a jeep in the line of traffic backed up at the red light stopped short so I could exit the lot in front of him once traffic started moving again. I assume he didn’t live there either. Maybe he was an angel sent to restore a minute shred of faith in humanity. Well, friends, this about wraps up this epic adventure, save getting caught in rush hour (and as I finally found out, Mariner baseball) traffic on the way back to downtown Seattle. I look back on it fondly because I am choosing to ignore the bad parts and remember the good ones. It really was quite an adventure. I do recommend it, and would do it again if I ever had the reason to go to Issaquah again. I would not drive into town at all, rather I would just go straight from the Interstate to the trailhead and take off after my ride. Thanks for joining me once again. I look forward to our next adventure. I’m almost never over in Seattle in an automobile, thank God. When I am, I like to take advantage of the exorbitant fee I am paying to drive over on the ferry. Soon I have to give someone a ride to the airport and have stylings on a hybrid adventure that I eyed last November, but bailed on due to weather and the uncertain, untested nature of my directions. Instead, on that occasion after making an early morning trip to the airport I opted for my Boundary Bay trip where my feet don’t touch the ground from the airport to Bellingham. Well, except for at that rest stop several miles outside of Bellingham where I take a nap. Even though that adventure is by car, it’s still grand. Nothing like waking up after my nap, stretching my legs, maybe doing some exercises in the wooded area in the middle of the rest stop, then motoring on up to Boundary Bay just before opening time, securing a parking spot right in front of place. It’s like: I’ve got the whole day in front of me, and one of my brewery meccas all to myself. (Actually, I’ve never had it to myself. Seems a few regulars are always sitting in there before opening time). When in Bellingham, I used to hit Chuckanut Brewery, but since there is a new brewery in town now, I skip Chuckanut. I don’t really like their beers. Now there is Kulshan Brewing nearby, which is pretty good. 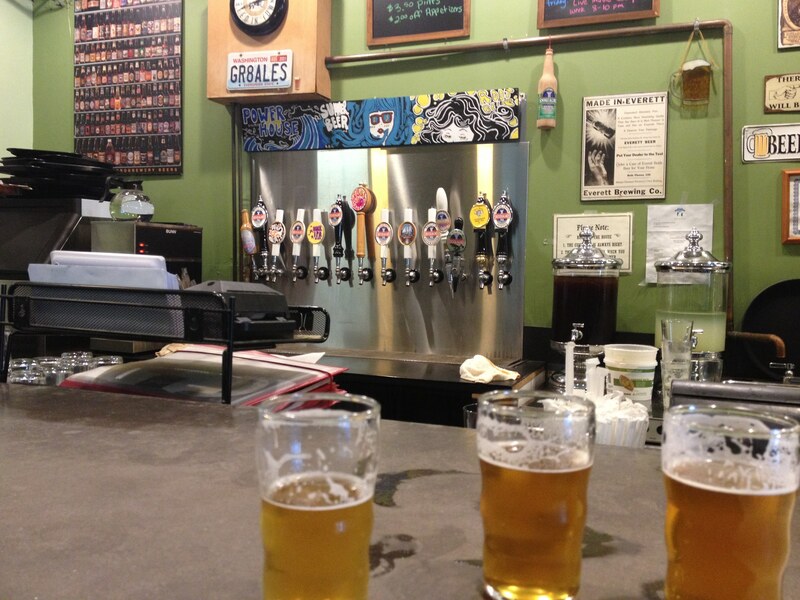 These days, I understand there is a new place called Elizabeth Station – a bottle shop that has beers on tap. I would definitely like to check them out. Of course the challenge here is to really limit one’s self, as there are places to stop on the way home as well. These places have included Diamond Knot, Skagit River Brewing (not recommended at all), and North Sound Brewing (recommended). I have had success in getting the beertenders at Boundary Bay to let me do tasters only, which is actually immensely enjoyable. This time, my decision will be way easier on the way from the airport, however, as the bridge near Mt. Vernon is out. Enter my epic hybrid adventure, the directions for which have been living in a drawer for months. Relying solely on Google Maps, I have planned a bicycle ride from Issaquah to Snoqualmie. 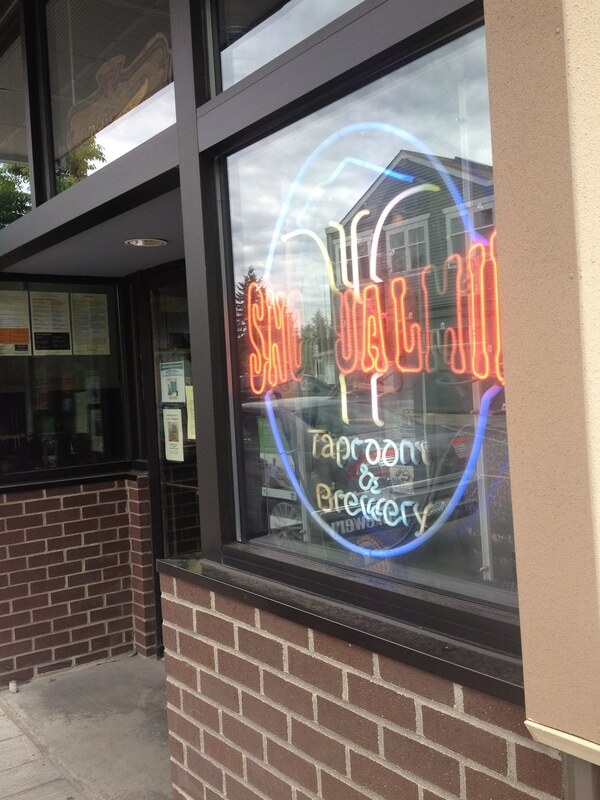 I’ve never been to Issaquah, but I plan to visit their Rogue Ale House. From there there are supposedly separated trails much of the 14 mile or so trip to Snoqualmie, where I get to visit Snoqualmie Falls Brewing. I have been there before. I suppose this doesn’t sound too epic. It’s just that I’ve never confirmed that these trails exist, (except via Google Street View which is pretty good evidence), and it seems too good to be true. What’s more, at a certain point the map shows one of the trails dead-ending tantalizingly close to where it could make a connection to a residential street that would connect to another trail that would take me basically all the way to my destination. So I will have to go down that trail and see if it goes through. If not, I’ll have to turn back and instead get out on some country roads with no shoulders, where I expect trucks hauling boats, and travel a few miles to where I can pick up a trail. So if I go missing, send the search party to look between Issaquah and Snoqualmie. Look for an account of the adventure complete with map and photos right here!